Ramps no longer need to be unsightly or even obvious. They can be beautiful, practical and add to your home’s accessibility. One of the first obstacles one might face after a medical issue, or other unforeseen circumstance, is getting in and out of your home safely. Sturdy, well designed access ramps can solve this problem. We specialize in the installation of aluminum ramps (also known as modular ramps). These ramps can be installed in one day, can be easily removed and may not require permitting from your municipality. Ramps can be ordered in a variety of colors, different configurations and be installed to blend in with the landscape. Many times ramps can be used to access a side or rear door so as not to draw attention to your home. CERTIFIED is licensed by the state of New Jersey, is a member of the BBB of New Jersey and the National Association of Home Builders member and holds the Certified Aging In Place Specialist designation. Our customers get their ramps installed promptly from our courteous professionals. With the installation of our ramps, we can accommodate nearly any site condition at your home, and can help you regain your mobility in and out of your home. Your safety and satisfaction is our top priority! 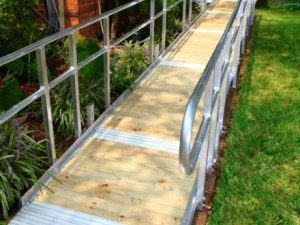 As a professional installer of aluminum ramps in the New Jersey and New York Metro areas, we have the experience to guide you in choosing the ramp that you need and make sure it is installed properly the first time.